Water is one of your body's most essential nutrients. Every cell, tissue and organ needs water to function. Sadly, I never liked the taste of plain water unless there was bit of fresh lemon or lime juice squeezed into it. I was excited when I discovered True Lemon about 6 years ago. Fresh lemons spoil easily and it's hard to carry them around in your purse! Well, True Lemon packets are the perfect solution! The packets are small, portable and taste like fresh lemons! Visit True Lemon's website and learn about the importance of water and how True Lemon can help you enjoy drinking more water! True Lemon – What is it? 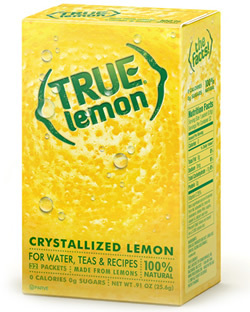 True Lemon is crystallized lemon made with 100% all natural ingredients. The True Citrus company starts off with freshly picked lemons and then uses a cold-pressing process. This process doesn't use heat, so the lemons maintain their optimal flavor. During cold-pressing, lemon oils and juices are extracted and then crystallized. This entire process actually locks in the flavor of freshly picked lemons! True Lemon believes that their product tastes better than any lemon you'll find in the store. That is probably true for people who don't have lemon trees in their yard!